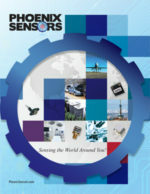 This silicon high pressure digital sensor was designed for demanding industrial and commercial applications. 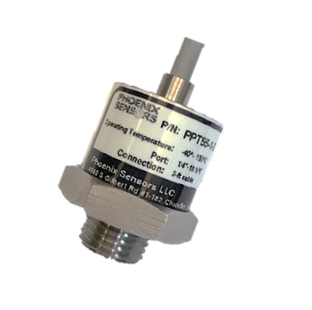 The stainless steel (316L) media isolated port design allows for pressure measurement of liquid or gas media. 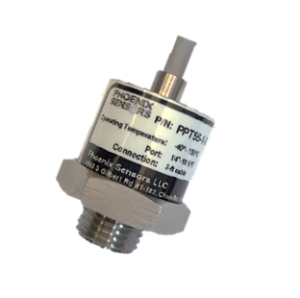 With the PPT56 high pressure digital pressure sensor’s operating temperature range, we solve Hydraulic Fracking Pump applications, Racing Engine applications, Steel Mill applications, and other industrial applications where traditional transducers cannot meet the high operating temperature requirements. The PPT56 series utilizes MEMS piezo-resistive sensors pressurized on the passive backside of the SS housing which has superior long term stability and accuracy (.15% Linearity). The two piece design is simple and proves valuable for OEM customers. This product is designed, manufactured, and distributed in the US. It is an ITAR compliant product. Please contact us for Custom design availability.